Glaucoma is the most common cause of blindness in adults. In addition, children can develop pediatric glaucoma that also leads to permanent vision loss. Here at Wichita Optometry, we want to help you better understand glaucoma with these frequently asked questions. Glaucoma is not just one eye disease but a group of eye conditions that result in permanent blindness in patients. If you have glaucoma you may not realize it because there are not that many clear symptoms of glaucoma. Yet by getting an eye exam on a regular basis, your Wichita optometrist can determine if you have signs of this vision disease. Can Glaucoma be Cured or Treated Successfully? Unfortunately, there is not a cure for glaucoma. However, we do have modern ways in medicine that allow our eye doctors to treat glaucoma symptoms, such as vision loss. While we cannot reverse vision loss, we can use treatments to slow the progression. In addition, we can provide you with improvements to your remaining sight so that you can see more clearly with your current range of vision. Treatments for glaucoma include eye drops, prescription drug medications, filter surgery, and laser eye surgery. When Should I Get Tested for Glaucoma? We recommend that all healthy adults get tested for glaucoma when they receive their annual eye exam. However, since this is a slowly progressing eye disease, the most common patients diagnosed with glaucoma are those over 40 years of age. If you fall in this age group and are struggling with symptoms associated with glaucoma we recommend you visit the eye doctor as soon as possible. 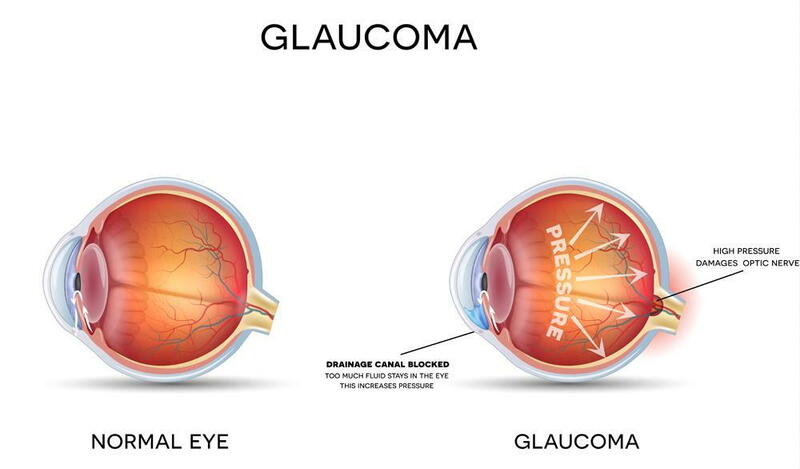 Symptoms common to glaucoma include eye pressure, eye pain with headaches, hazy vision, and partial vision loss. To examine your eyes for glaucoma we recommend making an eye exam appointment with our optometrist in Wichita, KS. Here at Wichita Optometry, we have a team of eye doctors ready to assist you with comprehensive eye exams, as well as treatments for glaucoma. For your convenience, we have two locations in the Wichita area. One office is on W. Douglas Avenue while the other is located on North Amidon. Request an appointment at the location nearest you. Contact our office today at 316-942-7496 to schedule an exam for glaucoma.